Google Reader's social features just went dark. I'm distraught. What are my alternatives? Google Plus doesn't work, since for many of us, it's blocked at work. We can still read our feeds, but how can we share? Can we use the "Send To" feature to somehow funnel everything to a shared blog, which we then can all subscribe to via RSS? And what about commenting? I'm seriously in tears over this. Hope me, MeFi. There will be greasemoney scripts that add back all those features. Just give it a week or so. Check LifeHacker.com daily. You might be able to do something with Ifttt. Maybe sync favourites to a delicious account or something similar. These guys are building an exact copy of the old Google Reader. I've set up a Tumblr blog and am using if this then that to feed content to it. I'll be adding the stuff I find in Reader to it through the "Send To" links. You can set up multi-user blogs in Tumblr, so if your current sharing setup is a small, close group, that might be a good option. I believe they allow setting up Disqus for commenting as well. Yeah, it's a total shambles. Reader was a great social network. I joined Findings, which is in many ways my ideal social network, but I know of only one other person using it. To clarify, Findings isn't an RSS aggregator, but it functions much like now-defunct Reader bookmarklet, allowing you to share quotes from webpages and e-books with a circle of followers. It links to the webpage. Newsblur is quite good if you want to leave Reader and only want outgoing sharing. Or stay with Reader and use the Feedly interface for social-izing. If it's just the redesign that's got you down, give it a week or two and there will likely be plenty of Greasemonkey scripts rolling back the change. The new scheme is actually very similar to an old script called Helvetireader, so major alterations to the interface through scripts is definitely possible. I wouldn't be surprised if some integrated with that Sharebros project, to complete the restoration. Seconding ifttt. It's a simple IF this THEN that (as the name suggests) that works really well. I'm not sure if it is setup for the "new" Google Reader yet, though. Another way: Create an Evernote account. Give everybody in your group the password. Add the Send to Evernote plug-in. I created a delicious stack with as many alternatives I could find. None really replace the social sharing aspect but I'm keeping my eye on HiveMined. If it's just the redesign that's got you down, give it a week or two and there will likely be plenty of Greasemonkey scripts rolling back the change. Ah, that's what I'm hoping for. I don't care about the social stuff but I want my nice compact view back, not this too much whitespace crap. I've been sending all my reddit links to Tumblr using ifttt. It might not be a bad idea to do the sharing that way and use Disqus, as duien has suggested. It's a slightly more manual process, but I share my good Reader links (and other stuff) in Pinboard. Others can then subscribe to that RSS feed in Reader if they want an integrated experience. You have to use bookmarklets / extensions to add the link from Google Reader. If you use a third party app like Reeder it's a one click share. I hate the extra whitespace too, so here's what I did as a temporary solution until somebody Greasemonkeys up a better one. It's for Firefox, but I bet you could make it work on other browsers too. 3. Save and relaunch your browser. That should get rid of the gigantic annoyance that is the top part of the new Reader layout. It's still ugly as sin but it's at least somewhat more tolerable now. 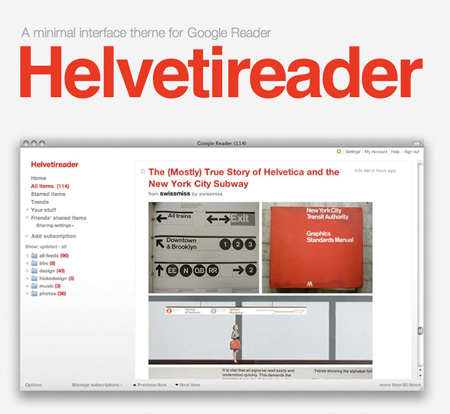 Just found this (for Chrome browser only): Google Reader Rectifier which claims to make the layout a bit nicer. Doesn't bring back the social features, though. And oh, this was tested in Opera. Other browsers' mileage may vary.